New manager Paul Lambert says the squad have given him everything in training, which is one of a number of aspects of life that has changed since he took charge at the club almost a fortnight ago. “They’ve given me everything, they’re enthusiastic to learn the game which is important and they’ve been great, they really have,” Lambert enthused. “We’ve had absolutely not one problem with them. I think they’ve been really good to work with. “I think when you come to a club and they’ve been beaten or are not getting results and the feeling’s not good you tend to find sometimes that your team don’t even like the team and our job is to try and rectify this to get it up and running. Fitness coach Jim Henry said at last week’s Supporters Club AGM that training is more football-based under the new management team than it had been during Paul Hurst's short-lived tenure, but Lambert says he’s not asked how things were previously. “I don’t really ask what happened before because I can’t affect it,” he said. “I don’t really get involved with what happened before. “Everybody’s got their own way of training, I just have my way, I just see certain things that I think maybe we can get better at or we can work on, but I never really compare what’s happened before, that’s unfair on the last manager. “I’d never do that, it’s just my way really, just the way I want to play the game and the way I want to train. The only difference is they have to get used to it. The only difference is that it’s a different way. Lambert, a Champions League winner with Borussia Dortmund in his playing days, has impressed his new players with his ability on the training field, Cole Skuse having made his admiration known to the media earlier this afternoon. “It wouldn’t be hard to do that with Skuse!” Lambert joked. “No, I don’t do it much, I played for Dortmund legends against Liverpool at the start of the season over in Dortmund, which was great, and I played in the Liam Miller tribute in Ireland which was great. Training ground banter between the incoming staff and players is evidently already in full swing and Lambert believes it’s important that the squad should have fun when at Playford Road but while also taking matters seriously at the right times. “I think I said when I came in you’ve got to have fun with your work, you’ve got to have that release, you can’t always be 24-seven where you’re serious, it’s not good for anybody, it’s not healthy, it’s not the way I work to do that,” he reflected. How has he found the mood compared with other clubs he has taken over in similar positions? “Even at Stoke I had some great guys there, they liked to laugh as well, really good guys, I’m still in contact with one or two of the guys, they text me which is nice. “But you go in at any club and you have to suss for yourself what’s wrong and what’s right, how you pick them up and what makes them tick and what doesn’t make them tick. “I think you have to try and suss through that pretty quickly and you tend to find you can push a few buttons more than others. I’ve been really fortunate that I’ve managed some really top, top players." As well as changing the training routine - the players were in on Sunday but had a day off on Monday - Lambert called the squad in early ahead of Saturday’s game with the players arriving at Portman Road before midday for a pre-match meal. Lambert had praise for the squad’s senior pros such as skipper Luke Chambers and Cole Skuse, who he sees as hugely important. “Skuse and Chambers have been brilliant, they’ve been excellent,” he said. “The experienced lads, Bart, Deano as well, have been brilliant along with Luke and Cole. Once Saturday’s game got under way Lambert was on his feet, kicking every ball, making every tackle and appealing for every decision. 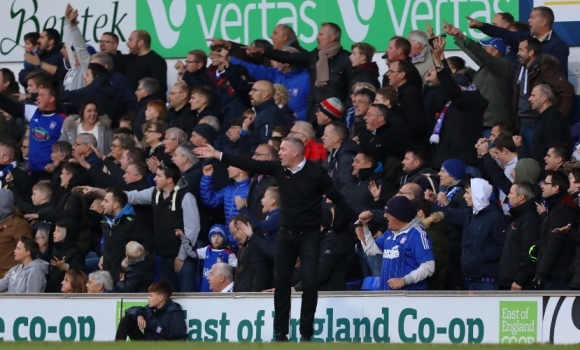 He quickly appears to have established a rapport with supporters, despite his history at other East Anglian clubs. “I just sense a club that wants to do really well and when you’ve been hit a lot of times there is that apathy at certain times,” he considered. “But you have to pick it up and you have to get the supporters and the players relating to each other. “You’ve got a helluva chance then but you just think there’s some really good people here that want to do really well and I think our job is to come and pick that morale right back up, whether that’s supporters, people in the stadium or people at the training ground. Following Saturday’s match at Reading there’s a two-week break before the home match against West Brom on Friday 23rd November, however he says the squad won’t spend all of that time training, they’ll need some downtime as well. “You can’t flog a dead horse every single day,” he said. “You have to train them the way you think is right but you also have to give them time as well. 'Flogging a dead horse', probably wasn't what you wanted to say Paul. However, everything else he says is very positive and really does show how dull and uninspiring the previous man was. Lambert has a ton of experience which he is bringing to the group. We just need a bit of luck to turn the tide and get us moving. I have the greatest faith in Paul Lambert, everyone could see what he is all about in the way he virtually played the game from the touchline last Saturday, myself and my family thoroughly enjoyed watching some really decent football, things needed to improve and indeed they will with Paul, congratulations to Mr Evans for this extremely wise appointment, I'm sure that he will make adequate funds available to Paul in January, I am equally convinced that Paul knows pretty well where the weaknesses in the squad are, at last we have something to look forward to.